Drawing inspiration from Frank Lloyd Wright, this home is fitted with intricate windows and expansive openings that allow for magnificent views and fluidity between indoor and outdoor spaces. Almaden Valley, a landscape of undulating hills, oak trees, and meadow in San Jose, California, presented both a challenge and an opportunity for landowners Brian and Mary Haas. Their 6-acre plot of land offered panoramic views of the valley to the south and a quarry mountain peak to the north, the same sandstone quarry that built Stanford University, where Brian earned his PhD in aeronautics and astronautics. Building a house that fit the contours of the site, however, would require ingenuity and technical mastery. Luckily, the Haas couple had plenty of both on their team. Architect Amy Davis and interior designer Heidi Smith (both members of the family), Tony Yaconelli of Pacific Builders, and Brian and Mary themselves collaborated to build a Prairie Craftsman home that harmoniously integrates with the land and views. For design inspiration, Brian and Mary turned to fellow Wisconsin native Frank Lloyd Wright. His architectural signature is apparent in the residence’s strong horizontal lines, dramatic eaves, and cantilevered roofs. During the planning stages, Brian manipulated a 3D rendering of the house to hew closer to his vision. “The clerestory windows complicated the design of the house. We made it impossible to give sheer strength, so we had to build the house as a steel skeleton, almost like an airplane,” says Brian, who worked at the NASA Ames Research Center and is now in the semiconductor equipment industry. The steel infrastructure prevents the house from moving in an earthquake, contributes to the open floor plan, and – most importantly – supports the clerestory windows in the main hall and office. The complex design required all of the windows to be custom, with a separate architecture of their own. Moreover, because the builders were working with unrelenting materials like concrete and steel, there was no room for error. The originally prospected window manufacturer balked at the task, so Yaconelli introduced the homeowners to Kolbe Windows & Doors, whose custom craftsmanship carried the visionary plans to fruition. 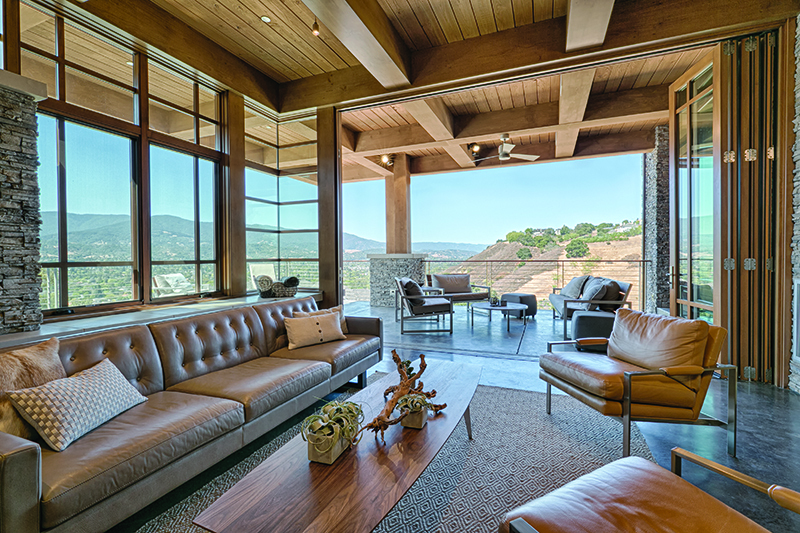 In the living room, corner windows seamlessly frame expansive views of Almaden Valley. Performance divided lites form dramatic patterns of light throughout the home while 10-foot-tall folding doors extend the living space to a large outdoor patio. “I wanted the ability to bring light in at any angle, any time of the day,” Brian explains. Kolbe’s Ultra Series windows and doors were the perfect solution for this unique design, offering expansive openings, 180˚ views and a rich chutney exterior finish to contrast with the hues of the natural building materials. Comments on: "Sponsored Content: An Architectural Feat in Silicon Valley Tames a Rocky Landscape"